FaeryLand was first exhibited in Texas Paper, 1999. To see this installation click here and follow prompts to see how this piece was made. FaeryLand was to be exhibited in Secret Wars, representing the dreamlike state in the United States for many people at the end of the Clinton Presidency. Before the exhibit opened September 21, 2001, the World Trade Centers bombing happened. 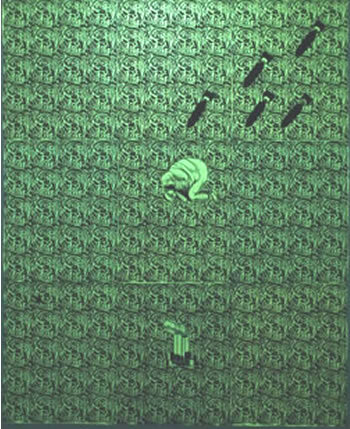 In the 10 days before the exhibit was opened, the print was reprinted, adding elements such as those in the upper right. 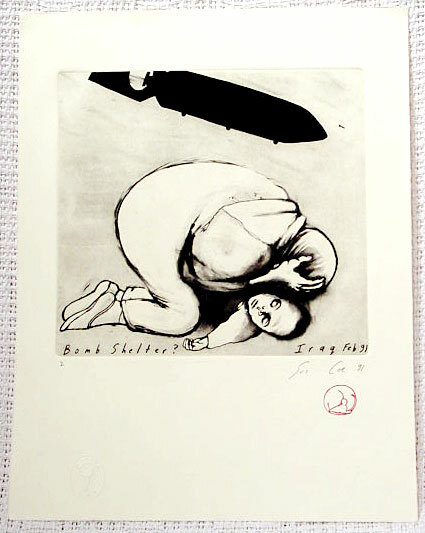 Sue Coe's Iraqi Bomb Shelter, 1991, was appropiated. As an Iraqi mother shelters her dying child from U.S. bombs, the World Trade Center was being attacked. Molded paper linoleum block print on glow-in-the-dark hand made paper. Each section 44" x 35 1/2"